This article courtesy of PetMD.com. Lymphoma is a type of cancer that originates in the lymphocyte cells. A type of white blood cell, lymphocytes play an important and integral role in the body’s defenses in the immune system. There are two forms of lymphocytes: B and T cells. Lymphoma may involve neoplastic proliferation of T or B, or non-B/non-T type lymphocytes, occurring primarily in the bone marrow, lymph nodes, and visceral organs. Lymphoma is found to be responsible for around 90 percent of blood cancers and account for about 33 percent of all tumors in cats. Moreover, it is the most common cause of hypercalcemia in cats. The incidence of lymphoma is believed to be associated with exposure to feline leukemia virus (FeLV) and the feline immunodeficiency virus (FIV). Cats that have been infected with either of these viruses have a significantly higher rate of lymphomas than the general cat population. You will need to give your veterinarian a thorough history of your cat’s health and onset of symptoms. The history and details you provide may give your veterinarian clues as to which organs are being primarily affected. Knowing a starting point can make diagnosis that much easier to pinpoint. 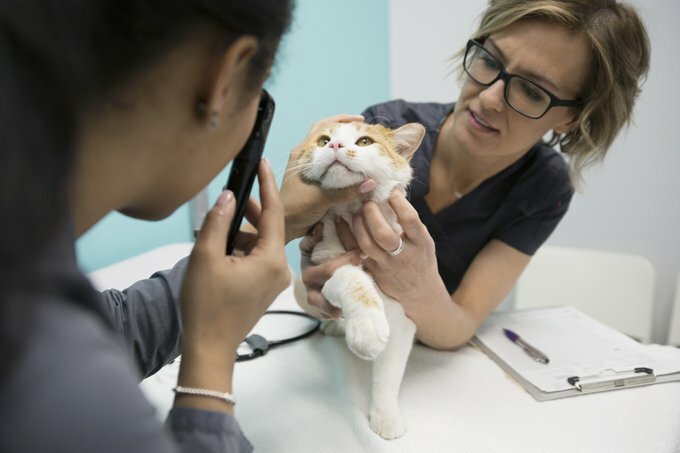 Once the initial history has been taken, your veterinarian will perform a complete physical examination on your cat. Routine laboratory testing includes a complete blood count, biochemistry profile, and urinalysis. The blood test results may show anemia, or the presence of an abnormally high number of lymphoblasts in the peripheral blood, a condition called lymphoblastosis. Lymphoblasts are immature cells which differentiate to form mature lymphocytes; they are normally present in the bone marrow, but if they proliferate uncontrollably they may migrate to the peripheral blood, resulting in the abnormal condition called lymphoblastosis. Biochemistry profiling may show an abnormally high creatinine, serum urea nitrogen, liver enzymes, and calcium levels. The urinalysis may reveal abnormally high levels of pigment bilirubin and proteins in the urine. Affected cats are also tested for the feline leukemia virus (FeLV), which is frequently associated with lymphomas. Your veterinarian will also use diagnostic imaging to locate the tumor(s), conducting X-rays of various body regions, especially the region that appears to be affected. A biopsy of the bone marrow will help in confirming the diagnosis conclusively. A cure is highly unlikely and there is no single treatment available to treat lymphomas. The major goal is to improve the quality of life for patients for as long as possible. Chemotherapy and radiotherapy can be used, but you will need to consult a veterinary oncologist to determine if your cat is a good candidate for this type of therapy. It will depend on the stage of the lymphoma (early or advanced), the age of the cat, and your cat’s overall well-being, amongst other considerations. Again, depending on the type and stage of the lymphoma, surgery may be performed in some patients. This may be a viable solution for some types of intestinal obstructions and for the removal of masses. A surgical incision would also allow your veterinarian to collect a specimen of the tumor for laboratory evaluation. Unfortunately there is no cure available for this disease. The only resolution in some cases is to provide extra care to improve the quality of life in affected animals. It is important to closely monitor your cat’s food and water intake while it is in the recovery phase. Prognosis of this disease is highly variable and depends on the initial treatment response, anatomic type of tumor, FeLV status, and tumor burden. If chemotherapy is initiated, you may need to take your cat for regular evaluations. At each visit your veterinarian will conduct blood testing to determine the treatment response and also to check the status of any complications that are occurring due to the treatment that is in place so that adjustments can be made as needed. If chemotherapy drugs have been prescribed as a part of home treatment, be sure to follow the directions closely, as chemotherapy medications are highly toxic to human health. Basic precautions include wearing latex gloves before drug administration. If pain medications have been prescribed, use them with caution and follow all directions carefully, making sure that all members of the home are familiar with the medication schedule; one of the most preventable accidents with pets is overdose of medication. The survival time is highly variable, ranging from a few months to less than two years.